I don’t know about the rest of academic libraryland, but I have definitely overcome any delusions I was harboring of a summer work lull – things have been hilariously busy. Between building community and a structure of tools/strategies for the coming year at Claremont, winding down a long research consultancy for a consortium of California community college libraries, and preparing for my first time participating in ACRL Immersion as a faculty member (stay tuned for posts on all topics), the only palpable difference is that I no longer wear a wetsuit when I swim in the ocean. So, independent of breathing room, project work continues to forge ahead. And really, would I have it any other way? 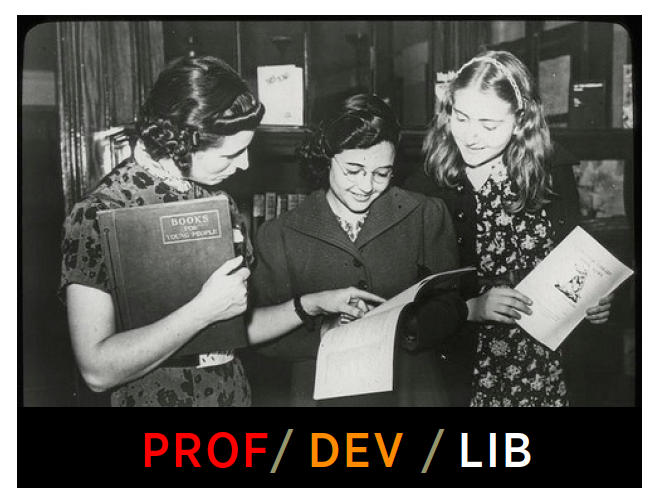 The previous installment of my orienting-to-Claremont series outlined an assignment design rubric a colleague and I adapted for faculty collaboration; this post describes the creation of the ProfDevLib, a local staff professional development library. e) finally put LibraryThing to good use in my own practice. 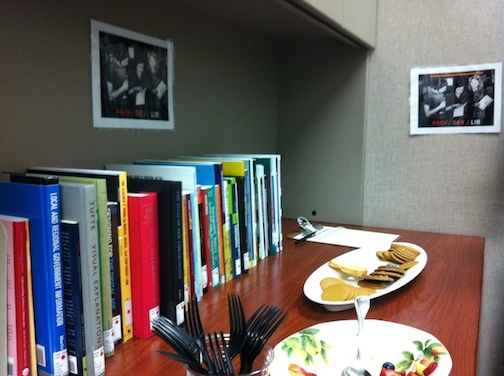 The idea for an informal professional development collection came from my recent days at UC Berkeley; Moffitt Library featured an oft-consulted staff library near my office cubicile. The collection at Cal focused on academic librarianship, assessment, research, instruction, web development, etc., and was tremendously useful to have close at hand. 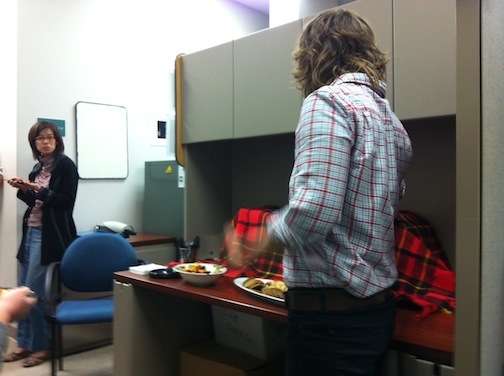 I usually had between four and six things signed out at any given time – materials circulated from a clipboard, and our department admin assistant would periodically hunt down offenders (such as myself) who kept items for an unseemly duration. I wanted to create the same type of resource at Claremont, with a few embellishments (catalog discoverability, formal location code, a LibraryThing profile, staff purchase request form, new acquisitions feed, reading discussion group, etc.). Armed with a generous budget and blessing from my director, I determined a location and circulation strategy, sought staff suggestions and bought the first round of fifty-odd items, requested a non-circ location code (HON PROF DEV), forwarded materials to our tech services unit for cataloging processing, requested a Blais featured list and new items RSS feed, built the LibraryThing profile, made up a few signs using our library typeface template, enlisted the help of my awesome new colleague Natalie Tagge to determine a reading group strategy and transition a few items from the circulating collection, and, finally, scheduled an unveiling with food/fanfare. All told, about $1500 and a month of low-intensity doings. 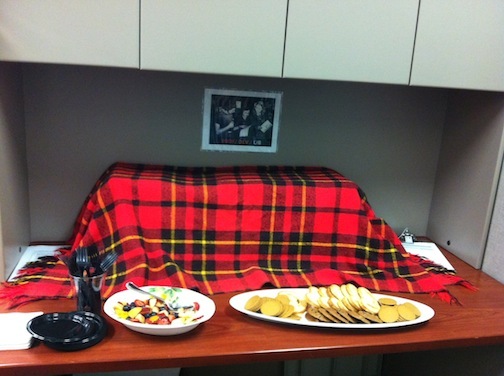 Thanks to all who came to watch the – literal – unveiling of the ProfDevLib from under a plaid blanket this morning (especially Adam, who provided a bagpipe serenade, and Natalie, who supplied fruit salad). For those jealous folks who didn’t make it, you can take items out of the collection anytime. More details on the ProfDevLib’s location and circulation “procedure” follows below the photos, info that will also be listed in the Resources area of the Library Staff Sakai site. Also, stay tuned for our reading group! The collection is located near Marsha and Mauricio in Iris North (signs point the way). It’s available for anyone to use, and its items are arranged in call-number order.The ProfDevLib will operate on an informal sign-out system via clipboard, but for discoverability purposes items are cataloged as non-circulating in Blais with the location code HON PROF DEV. Call number labels reflect this new location, and are also marked with a handy red dot to discourage you from sticking them in a book return. Long, D. (2011). 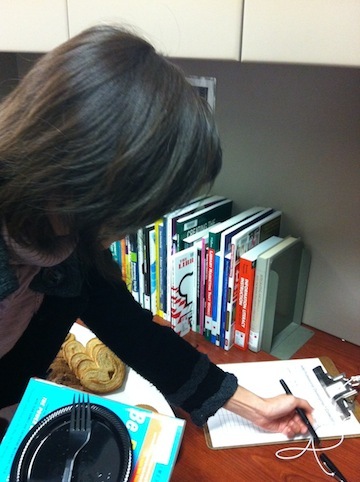 Embedded right where the students live : a librarian in the residence halls. In C. Kvenild & K. Calkins (Eds. 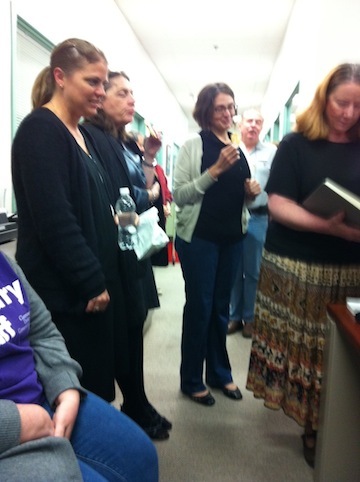 ), Embedded librarians: Moving beyond one-shot instruction. (199-209) Chicago: Association of College and Research Libraries. Items are now circulating and five additional purchase suggestions have come in since the unveiling, all of which is a nice early indication of use/interest. A final goal is to “encourage” (e.g., target) individuals who suggest purchases to select excerpts and lead the discussion group from time to time. What remains to be seen, obviously, is how much productive use the ProfDevLib actually gets, and whether the approach needs to be tweaked in any direction. In all, a seriously fun project. Until the next installment, when I’ll introduce you to project curve, part four: faculty swag bags.